An Eagle Silver Dollar is a great investment not just for the 1 troy ounce of silver content, but also for the collectability of this very popular silver bullion coin. The obverse (face) of the Eagle Silver Dollar has a hopeful walking statue of liberty. This is known as the ‘Walking Liberty’ design by renowned sculptor/engraver Adolph Weinman. The reverse is a striking heraldic eagle designed by John Mercanti. 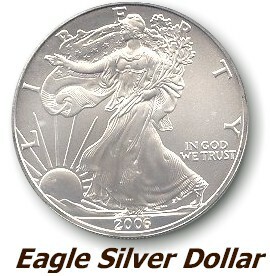 Silver American Eagle Dollars were first introduced in 1986 and have been produced ever since. While the current price for an uncirculated silver eagle is very reasonable at around $20; the price starts climbing from there for collecting. For example a 1986 Eagle Silver Dollar PCGS graded MS-70 is currently valued at $4000! Even American Eagle Silver coins in good uncirculated condition are commanding a premium. Expect to pay slightly above the current silver bullion price for a recent year uncirculated silver eagle. Collector quality premiums go up from there!